Eric Cantor is a Liar and NO Conservative/Republican! I would exclaim - "UNBELIEVABLE," But it actually isn't. The fact that Eric Cantor and his campaign lies is nothing new, to those of us who actually pay attention to facts. Just watch the video commercial I have included. It is a current TV commercial being run by the Cantor bunch. If false advertising were illegal in the political world, as it is in the real business world, someone would be going to jail. The video begins with a caricature of David Brat holding a book that says "Economics 101." Fine, he is an economics professor and is more than passing familiar with the subject. Sadly, it is Eric Cantor who should be taking Economics 101, given his voting record on economic issues. It then calls Cantor our "conservative" Congressman. Well now, I guess that all depends on how you define "conservative." More on that later. It then points out that Brat worked on Tim Kaine's Board of Economic Advisors, as did several other economists and businessmen, all of varying political backgrounds. The implication here is that since Brat served on Kaine's Board, Brat must be a liberal, too. OK, let's carry that to its logical conclusion; Brat also served on Republican Bob McDonnell's Economic Advisory Board. Does that now make him a conservative? If not, why? I'm just using Cantor's logic here. Yeah, Kaine tried to raise our taxes. Can Cantor or any of his minions point to any evidence which shows that David Brat advised Kaine to do that or would a further investigation ruin Cantor's assertions by showing that Brat advised just the opposite? Can't have facts getting in the way, can we Eric? It goes on to say that "Liberal, David Brat, is running for Congress as a Republican" and then questions whether he is really a Republican. Remember how they did the same thing to me? Remember how they spent so much time and money painting me as a "liberal?" Anyone who has spent more than two-minutes on my blog or FaceBook page knows what a lie that was. But let us return to Cantor's questioning of whether or not Brat is a true Republican. If we apply one's actions and VOTING RECORD to the Republican Creed (Just go any Republican website and look at it), we see that Eric Cantor is NO CONSERVATIVE and he certainly is NO REPUBLICAN! Rather than address Brat's lifelong record as an educator and/or debate Brat, so that the voters can hear from the two candidates themselves, Cantor just continues to lie and distort. He does this because he is counting on the usual low-information voter ignorance/apathy. It is the usual despicable, low-life, dirty politics that so many Republicans claim to hate, when it is done by Democrats. I wonder why those same Republicans allow their own to get away with it? 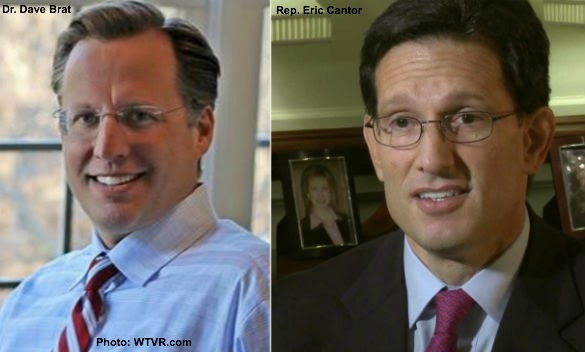 In the meantime David Brat addresses Cantor's actual voting record and compares it to Cantor's rhetoric. No personal attacks, no lies, no distortions, just the facts about how Cantor's voting record belies his claims to be both a conservative and a Republican. I have posted numerous times about Cantor's record. But even without my doing your homework for you, as a voter, if you really care about the truth, you should do your own homework/research and look at Cantor's record for yourself. Don't allow Cantor to get away with the same kind of lying that you rail against Democrats for doing. Show Cantor that you are not as ignorant, apathetic, and yes, even as stupid, as he thinks you are - as he hopes you are. Do the research! Eric Cantor a Republican and a conservative? Come on Eric, you've got to be kidding.